For deeper scratches and swirls you may need a pad with more cutting power than an orange light cutting pad or other less aggressive options. This pad is Lake Country's firmest foam pad designed to work with any standard backing plate. We recommend using this pad after you have exhausted your polishing possibilities with less aggressive polishes and pads. 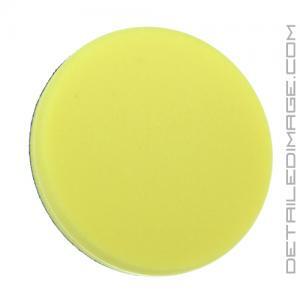 Use the yellow cutting pad with a compound or heavy cutting polish for deep polishing power. This pad is designed to give you maximum cutting power so you can remove deep imperfections which will leave the surface with a light haze. This haze is to be expected and can be removed with lighter pads and polishing combo. The Lake Country Yellow Cutting Pad is a great pad to help restore your paint to a brilliant shine, but only use it as needed. I love this pad! I worked on a S400 Mercedes Black and I used Menzerna 400. That pad cut the swirls and scratches out of that paint quickly and left the car looking beautiful . I just followed up with Menzerna 3800 with a polishing pad / light cutting. I will say that you have to know your products and what it will do on different paint. I saved a lot of time using this pad. Yes I would recommend this. I like this pad, just be careful of corners or it is easier to burn your paint off if you buff that spot too hard! As I did unfortunately! Great pad for heavily defected surfaces. Loves to dust though even with a no-dusting compound so be ready for that.